Everyone knows pool heating can be costly for homeowners—especially if the pool is not being covered. As a result, many are making the move towards sustainable technologies such as solar energy. For most, when thinking of solar energy an image of large solar panels may come to mind. Very few think of invisible solar heating because it is a relatively new technology. This article will discuss how homeowners can potentially harness the sun’s energy without using typical roof-mounted solar panels. When walking along a driveway, backyard pool patio, or even a backyard deck, it becomes very clear how much energy is emitted by the sun. Paver, brick, stone, and even wooden patio temperatures often exceed 65.5 C (150 F)—enough to burn the skin within seconds—simply as a result of sun exposure. This can occur even on relatively cool days. On hot days, paver temperatures are known to exceed 82 C (180 F), which can burn skin immediately on contact. With these temperatures, beautifully designed spaces cannot only become uncomfortable, but even dangerous. In cooler climates, water temperatures can remain low, leaving bathers cold in the pool, but with burning feet upon exiting the water. Today, there are methods available to capitalize on the heat absorbed by these hardscape (e.g. stone, bricks, pavers, wood) surfaces and other sun-exposed areas which are capable of holding significant thermal energy from the sun. This heat energy can be extracted, which will not only cool the surface down but also allows it to be used elsewhere. Essentially, these surfaces are used as thermal batteries in which below-ground solar collectors can pull the energy out to use it elsewhere. A below-ground solar heater (i.e. hydronic system) circulates fluid (glycol and water mix) through panels located under the paver surface and, as it heats up, it passes through a heat exchanger, which transfers it to the pool or hot tub water. This will in turn cooldown the surface of the patio to a more comfortable, safe temperature. Modular hydronic systems are capable of efficient heat transfer and, therefore, can effectively capture the thermal energy stored in pavers, stones, bricks, or deck surfaces. 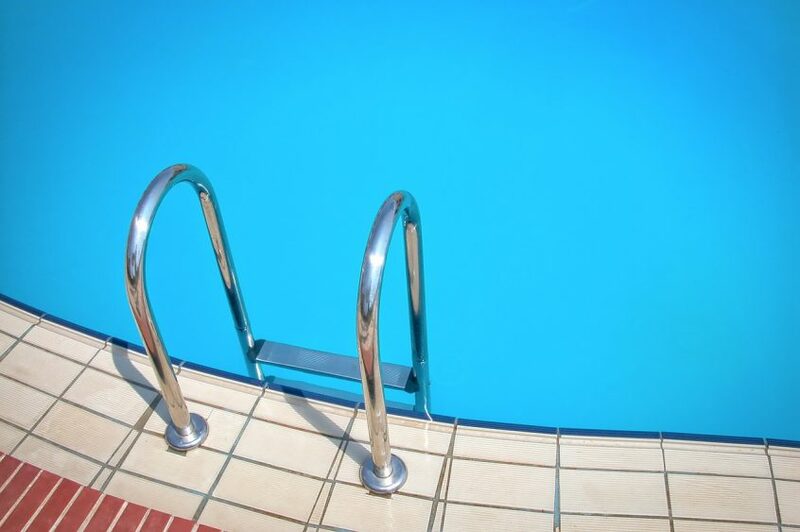 In most cases, homeowners like to keep their pool at a standard water temperature. A hydronic system is capable of automatically circulating fluid to heat the pool to the desired water temperature and, when necessary, it will stop when that temperature is reached. What happens when the pool gets too hot? A below-ground solar heater (i.e. hydronic system) circulates fluid through panels located under the paver surface and, as it heats up, it passes through a heat exchanger, which transfers it to the pool or hot tub water. If the pool reaches the target temperature, fluid will stop circulating through the panels. This prevents the system from continuing to heat the pool; however, it will also stop cooling down the patio/deck surface. Therefore, in cases where patio cooling is necessary, the system can have an alternative location to dump the heat energy, like a pond or domestic water heater. This allows the system to continue drawing heat energy from the patio/deck to cool it down even when the pool does not need to be heated. If the project is such that there are no alternative means for the excess thermal energy heat, a chiller can be installed to cool and compensate for the surplus heat energy. This is, of course, only necessary when patio cooling is required. It should also be noted, when designing a system, all of these scenarios can be mapped out based on the climate of the pool location, pool size, patio/deck surface material, paver color, target pool and patio temperature, amongst other attributes. This type of mathematical planning allows designers/builders to determine if a particular location would benefit from having a chiller, a pool heater, or if the location could possibly run into problems with excess or deficient thermal energy. This analysis can also determine the return on investment (ROI) for a particular project. What if there is not enough thermal energy for pool heating? When there is not enough thermal energy to heat a pool to the target temperature at any specific time, a pool heater can make up the difference. Even when this is necessary, a below-ground solar system can potentially reduce pool heating costs enough to elicit a rapid ROI. Every type of pool heating system has different operating costs with the most expensive often being electric. Replacing an electric pool heater with a hydronic system will give the homeowner the fastest ROI, while a slightly slower ROI will be observed when using a gas heater. The below-ground solar heater manufacturer provides on-site training for the contractor to ensure a proper and efficient installation. Most of the time, the plumber or mechanical contractor will be in charge of installing the system, so piping, manifolds, pressures, and heat loads are of minor concern to the hardscaper. These systems are also pre-designed by the manufacturer with specified pumps, pressures and layouts, making the install seamless, as it is well thought out and planned ahead. Any concerns with equipment compatibility will be addressed by the manufacturer, therefore, leaving nothing in question. The installer (i.e. mechanical contractor, plumber, etc.) will also work closely with the landscaper to ensure the entire process is coordinated. If a standard-size pool, equipped with a propane heater, was installed with a below-ground solar heating system, the operating time of the fossil fuel heater could be reduced by 75 percent to maintain a constant water temperature of 30 C (86 F).When factoring in the cost of propane and assuming weather conditions were steady each month, and a pool cover was used 10 hours a day, the return on investment (ROI) for the below-ground solar heating system would be approximately six years.Further, patio surface temperatures can reach upwards of 74 C (165 F) in the summer (depending on the region), which is third-degree burn territory. 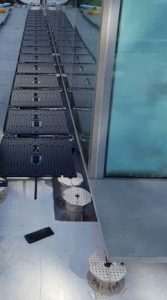 The below-ground solar panels can lower the surface temperature to 32 to 43 C (90 to 110 F) to create a cool and comfortable patio, while at the same time providing supplemental heat for the pool. For a pedestal mounted system, the paver installer will set the pedestals to the correct height. Following this, the panel installer will place the panel rows on top of the pedestals and adjust them accordingly. The landscaper then places the pavers on top of the panel. An on-grade system follows a similar installation schematic. First, the landscaper will prepare the ground surface (sub-base) for typical paver installation (keeping in mind the height differential due to the hydronic system). Then, the panels are set, connected, and tested by the contracted installer. Setting the panels is easy, as they are delivered in factory connected and labeled rows. The installer simply unfolds and sets the panels in place, where they can be adjusted accordingly. Once the panel system is placed on the sub-base, tested, and connected to the manifolds, the paver installer can add bedding sand and continue with the installation of the hardscaping (i.e. pavers, stones, or brick). based snowmelt systems are set-up. However, because each row of a below-ground hydronic system is custom-made to the plan’s specifications, laying out the rows and making the connections is faster and simpler. For instance, installing a panel system on a driveway can typically be completed in a half-day, while a tubing installation, on the other hand, may take a couple of days. On-grade installations are required to have a sub-base approved by the Interlocking Concrete Pavement Institute (ICPI). The sub-base should comprise a thin, 6.4-mm (0.25-in.) layer of sand on top of the base to fill any voids in the rough base material. A panel system provides structure to the base (acting as a second sub-base) and adds full support to the paver array. It is advisable to pre-compact the sand into the joints and crevices between the panels. This can be completed using a vibrating plate compactor that has a plastic base or a hand tamp. base, allowing for a very thin layer of sand on top of the system. Installing tube systems entails adding a layer of sand that is outside of the guidelines, meaning the pavers will no longer be covered under warranty. This is a major issue, as tubing systems often cause settling, or cracking and spalling due to uneven heating. 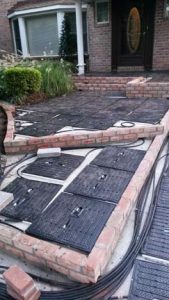 When using a grate-type support system mounted on a wood-framed deck or pedestals, any size paver, brick or stone, can be applied over top. Wood-framed decks can also be configured to support hydronic panels with just the framing and deck planks, while polyvinyl chloride (PVC) or other synthetic decking can be applied over the panels and fastened to the framing located between the panels. Below-ground solar heaters, patio coolers, and snow melting systems add a new dimension to any space. By supplying designers and architects with a tool that increases the functionality of a landscaped area, extends the season, or otherwise makes a space more useful, the designers are able to incorporate more into the area. 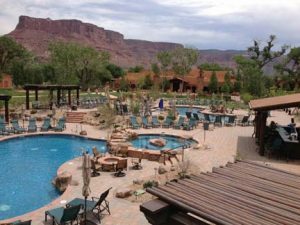 Hardscape professionals are capable of integrating this system with any surface—nothing hinders the design—creating endless opportunities for use in residential/commercial projects. In fact, homeowners and/or commercial property owners can find new uses for their spaces, while being more energy conscious and saving money in the long run. Below-ground solar heaters, patio coolers, and snow melting systems add a new dimension to any space. One of the most important features of this type of system is snow melting. The panel design ensures it remains in contact with a much larger surface area than a tube-style system, which prevents uneven heating. It also allows for lower operating temperatures and is more energy-efficient, as heat is transferred quicker. This also increases the paver’s lifespan, as it will not be exposed to irregular heating and cooling patterns, which can cause problems such as cracking and spalling. When incorporated on a property with a pool, the system is still capable of heating the water during the summer via solar energy, and in the winter, snow is melted in the area where the panels are installed. The system’s snow melting feature requires warm fluid to circulate through the panels. This involves tapping into existing boilers on a property, for example, to draw heat energy. This again is planned out by the manufacturer, making sure all issues are addressed well ahead of time. ground solar heating system can initially be costly. For smaller pools, using a below-ground solar heating system can remain relatively inexpensive, especially when coupled with low-cost techniques like solar blankets, pool covers, and other devices. However, in some cases, it is often hard for homeowners to foresee the future and realize the ROI this type of heating system will provide. Many are unable to see the added benefits and, therefore, cannot justify the cost to install one. On the other hand, many also turn to tubing systems for snow melting capabilities as they are often less expensive to install, but more expensive to operate. With limited capital, and no need to heat a pool or use the system for other purposes, these types of snow melting systems may be the best option when it comes to cost savings. Electric systems are also common for snow melting purposes. They are often used on small walkways or in front of doorways, as they can melt snow effectively with a relatively inexpensive installation. Although electric systems are the most expensive to operate, they may be the best option for certain spaces. This article was written by Max DesMarais and originally appeared on Pool & Spa Marketing [link].